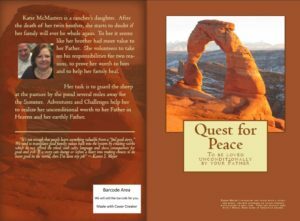 VIDEO ABOUT QUEST FOR PEACE Katie takes on huge challenges and adventures to try to prove her worth to her father. Katie Mc Masters is a rancher’s daughter. After the death of her twin brother, she starts to doubt if her family will ever be whole again. To her, it seems like her brother had more value to her Father, Caleb McMasters. She volunteers to take on his responsibilities for two reasons, to prove her worth to him and to help her family heal. Her task is to guard the sheep at the pasture by the pond several miles away for the Summer. Adventures and Challenges help her to realize her unconditional worth to her Father in Heaven and her earthly Father. Karen Meyer is from Scottsdale, AZ. Her favorite books are those with a story, which readers might come to the conclusion that because there is some truth, it might have happened in real life. All of Karen’s stories have a moral edge with a Christian voice.